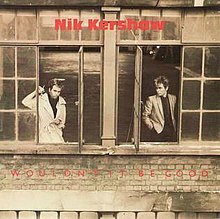 (1983) "Wouldn't It Be Good"
"Wouldn't It Be Good" is a song by English singer-songwriter Nik Kershaw. It was released one month prior to his debut studio album Human Racing. The release was Kershaw's second single, and features the non-album track "Monkey Business" as the B-side, which was also released as a bonus track on the 2012 re-release of the album. "Wouldn't It Be Good" was the second single from Kershaw's debut solo album Human Racing and turned out to be among his more popular single releases. It spent three weeks at #4 in the UK charts and became a hit throughout Europe, as well as a top 10 hit in Canada. Kershaw is also most closely associated with this song in the U.S., where it narrowly missed going Top 40. Kershaw performed this song at Live Aid in London's Wembley Stadium in July 1985. Kershaw's first single from this album had failed to be a major hit, and it was on the strength of this recording's success that the earlier single, "I Won't Let the Sun Go Down on Me", was promoted for a re-release. This time the single went all the way to #2 in the UK, becoming his highest-charting single there to date but not the most known. "Wouldn't It Be Good" was released in a single version and an extended 12" version. The main synth tune was produced using a combination of PPG Wave 2.2 and a Yamaha DX7. A remix by Simon Boswell, clocking in at 7:20, appears on the album Retro:Active 4: Rare & Remixed. The music video for "Wouldn't It Be Good", directed by graphic designer Storm Thorgerson, was released in 1984 and received heavy rotation on MTV, which helped the song reach No. 46 on the US charts. It used chroma key technology to achieve the alien suit's special effects. The music video was filmed primarily in and around St. James' Court Hotel, London. The closing scenes were recorded at the Mullard Radio Astronomy Observatory, near Cambridge. In 1984, German singer Juliane Werding recorded a German version of "Wouldn't It Be Good", titled "Sonne auf der Haut". In 1986, Danny Hutton Hitters covered "Wouldn't It Be Good" which appeared on the soundtrack for the 1986 film Pretty in Pink. In 1992, American singer-songwriter Tommy Page recorded a cover of the song for his album, A Friend to Rely On. German Eurodance group Cascada covered the song in 2006, from the album Everytime We Touch. It peaked at number 54 in Sweden only. In 2009, Placebo recorded their version as the B-side to their single "For What It's Worth". Tina Arena released a piano ballad version of the song for her 2008 cover album Songs of Love & Loss 2, which was later released as a digital-exclusive single as part of her greatest hits album Greatest Hits & Interpretations in 2017. ^ "The Official Nik Kershaw Website". Nikkershaw.co.uk. Retrieved 2012-01-08. ^ "Wouldn't It Be Good (1984)". IMDb. Retrieved 4 October 2016. ^ "Nik Kershaw". The London Salad. Retrieved 17 November 2017. ^ Kent, David (1993). Australian Chart Book 1970–1992 (illustrated ed.). St Ives, N.S.W. : Australian Chart Book. p. 165. ISBN 0-646-11917-6. N.B. The Kent Report chart was licensed by ARIA from mid 1983 until 19 June 1988. ^ "Austriancharts.at – Nik Kershaw – Wouldn't It Be Good" (in German). Ö3 Austria Top 40. Retrieved 4 October 2016. ^ "Ultratop.be – Nik Kershaw – Wouldn't It Be Good" (in Dutch). Ultratop 50. Retrieved 4 October 2016. ^ "Radio 2 Top 30". Top 30 (in Dutch). Retrieved 4 October 2016. ^ "Top RPM Singles: Issue 6753." RPM. Library and Archives Canada. Retrieved 4 October 2016. ^ CHART NUMBER 1429 – Saturday, May 19, 1984 at the Wayback Machine (archived 7 November 2006). CHUM. ^ "Lescharts.com – Nik Kershaw – Wouldn't It Be Good" (in French). Les classement single. Retrieved 4 October 2016. ^ "Offiziellecharts.de – Nik Kershaw – Wouldn't It Be Good". GfK Entertainment Charts. Retrieved 4 October 2016. ^ "The Irish Charts – Search Results – Wouldn't It Be Good". Irish Singles Chart. Retrieved 4 October 2016. ^ "Hit Parade Italia". HitParadeItalia (in Italian). Retrieved 4 October 2016. ^ "Dutchcharts.nl – Nik Kershaw – Wouldn't It Be Good" (in Dutch). Single Top 100. Retrieved 4 October 2016. ^ "Nederlandse Top 40 – week 11, 1984" (in Dutch). Dutch Top 40 Retrieved 4 October 2016. ^ "Charts.nz – Nik Kershaw – Wouldn't It Be Good". Top 40 Singles. Retrieved 4 October 2016. ^ "Lista Przebojów Programu 3" (in Polish). LP3. Retrieved 4 October 2016. ^ "South African Rock Lists Website SA Charts 1965 – 1989 Acts K". The South African Rock Encyclopedia. Retrieved 4 October 2016. ^ "Swisscharts.com – Nik Kershaw – Wouldn't It Be Good". Swiss Singles Chart. Retrieved 4 October 2016. ^ "Official Singles Chart Top 100". Official Charts Company. Retrieved 4 October 2016. ^ "Billboard May 26. 1984" (PDF). Billboard. New York, NY, USA. 26 May 1984. p. 60. Retrieved 4 October 2016. ^ "Billboard June 2, 1984" (PDF). Billboard. New York, NY, USA. 2 June 1984. p. 18. Retrieved 4 October 2016. ^ CASH BOX Top 100 Singles – Week ending JUNE 2, 1984 at the Wayback Machine (archived 1 October 2012). Cash Box magazine. ^ "Forum – ARIA Charts: Special Occasion Charts – Top 100 End of Year AMR Charts - 1980s". Australian-charts.com. Hung Medien. Retrieved 4 October 2016. ^ "Top RPM Singles: Issue 9638." RPM. Library and Archives Canada. Retrieved 4 October 2016. ^ "Top 100 Single-Jahrescharts 1984". GfK Entertainment Charts (in German). Retrieved 4 October 2016. ^ "Hit Parade Italia - I singoli più venduti del 1984". FIMI (in Italian). Retrieved 4 October 2016. ^ "Schweizer Jahreshitparade 1984". Swiss Singles Chart (in German). Retrieved 4 October 2016. ^ "British single certifications – Nik Kershaw". British Phonographic Industry. Retrieved 4 October 2016. Select singles in the Format field. Select Silver in the Certification field. Type Nik Kershaw in the "Search BPI Awards" field and then press Enter. ^ "Juliane Werding auf Platz 7 der Trendcharts von Music Control". OpenPR.de (in German). 14 January 2008. Retrieved 11 June 2017. ^ Green, Thomas (6 August 2012). "Interview: 10 Questions for Nik Kershaw". The Arts Desk. Retrieved 11 June 2017. ^ Allen, Jeremy (9 June 2017). "The 'Pretty In Pink' Soundtrack Was a Gateway to Alt-Pop and Proletarian Revolution". Noisey. Retrieved 11 June 2017. ^ "Obati Kerinduan, Tommy Page Konser di Jakarta Mei 2015". SINDOnews.com (in Indonesian). 27 March 2015. Retrieved 11 June 2017.